Abstract: Excavations in the type area of the Grund Formation (Middle Miocene, Lower Badenian) in Lower Austria showed four different lithofacies. Sandy beds with typical vertically arranged sedimentological features like erosive base, basal concentrations of coarse shell debris, mud-clasts and clast-horizons, normal graded beds, horizontal lamination of the upper plane bed, concentrations of plant and wood debris, asymmetrical ripples at the top, and synsedimentary deformation structures point to storm-induced event deposits. The sands were mainly deposited as tabular to slightly wedge-shaped sand-sheets; only extreme events produced channel-shaped sediment bodies. Pelitic layers at the top of such event-strata represent fair-weather conditions. The basal shell debris mainly contains mixed, synchronous-allochthonous, highly fragmented but determinable marine faunas from shallow to moderately deep environments. Together with land snails and bones of terrestrial vertebrates bottom currents transported the shelly fauna from shallow-marine to offshore areas. Paleocurrent data from groove marks, gastropod orientation, asymmetrical ripples and small dunes point to a transport towards ESE–E–NE, from a coastal area at the margin of the Bohemian Massif. The various lithofacies clearly reflect a proximal–distal trend from the shoreface to the offshore area. The development from the Skolithos to the proximal Cruziana ichnofacies to the proximal–archetypical Cruziana ichnofacies indicates an upward deepening from middle shoreface to upper offshore environments. The role of the Early Badenian transgression versus extreme storm events responsible for the proximal–distal trend and the lithological and ichnological development is discussed. Abstract: The trace fossils Arenicolites, Asterosoma, Diplocraterion, Zoophycos, Ophiomorpha, Saronichnus, Scolicia and Thalassinoides have been recognized in the siliciclastics of the Grund Formation. Their occurrence and distribution is related to storm deposition. In proximal storm deposits, only monospecific Asterosoma occurs. It is typical of the transition between the Skolithos and the proximal Cruziana ichnofacies. A more diverse trace fossil association of the proximal and archetypical Cruziana ichnofacies occurs in more distal storm deposits. The vertical structures (Arenicolites, Diplocraterion, Ophiomorpha) are related to opportunistic colonization of the storm beds (post-event community). The horizontal forms (Scolicia, Thalassinoides) represent fair weather conditions. The chemosymbiotic structures (Saronichnus, Zoophycos) are a record of trophic competition that pressures trace makers to deeper and more complex feeding than simple deposit feeding. The horizontal and chemosymbiotic trace fossils represent the resident community. The development from the Skolithos via the proximal Cruziana ichnofacies to the proximal–archetypical Cruziana ichnofacies indicates a deepening from the middle shoreface to upper offshore environments. Abstract: A new ichnogenus and ichnospecies Saronichnus abeli is described for a protrusive trace fossil produced by the lucinoid bivalve Thyasira michelottii from storm-dominated siliciclastics of the Miocene (Lower Badenian) Grund Formation. A chemosymbiotic life strategy under dysaerobic conditions is proposed for this bivalve. The trace fossil expresses an adaptation to oxygen-poor habitats. Abstract: The typical sandy, shell-rich deposits of artificial outcrops in the Grund Formation were identified as distinctly allochthonous event beds with channel-structures, sharp erosional bases, and graded bedding. They are interpreted as proximal tempestites and contain a densely packed, polytaxic molluscan assemblage. The faunal composition and taphonomic features of shells indicate that transport occurred from wave- or current-agitated nearshore habitats into a dysaerobic, pelitic, inner shelf environment. This pelitic environment was colonized by a single molluscan species, the chemosymbiotic Thyasira michelottii, which occurs in life position, as confirmed by valve articulation and preservation of the inhalant tube and postero-ventral tunnel networks. In contrast to the depauperate autochthonous fauna, the skeletal concentrations contain a highly diverse molluscan fauna. We identified 130 species from more than 4200 individuals, but two bivalve species, Timoclea marginata and Loripes dentatus, strongly dominate each of the five samples from different shell beds. In contrast, the diversity (measured as species richness and heterogeneity diversity) and the frequency distribution of shell sizes differ strongly between the five shell beds. A regression analysis identifies the diversity of the shell beds as a function of shell sorting. Poorly sorted shell beds have higher species richness than well-sorted shell beds. The diversity in Grund is therefore taphonomically controlled, because sorting of the allochthonous shell beds is determined by their transport history. 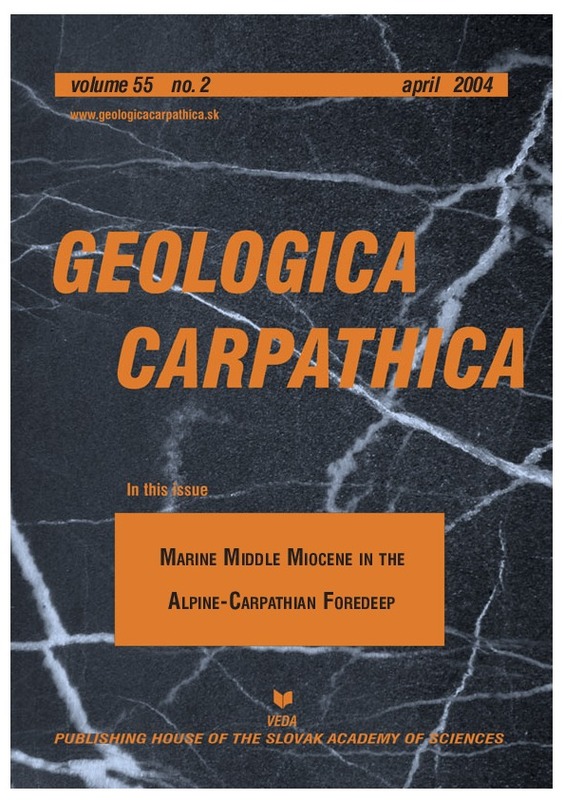 Abstract: The present study investigates the pectinid bivalve record characterizing the Middle Miocene Grund Formation from the Lower Austrian part of the Alpine-Carpathian Foredeep. The results provide the first comprehensive compilation of that pectinid assemblage, based on the recent excavation material and historic collections. Updating and revision of genus and species level taxa excluded polyphyletic taxa and allowed a more accurate correlation with occurrences from adjacent regions distributed across the NE Atlantic, Mediterranean, Paratethys and Indian Ocean. Hence 10 species level taxa — ”Chlamys” trilirata, Hinnites crispus, Crassadoma multistriata, Aequipecten malvinae, Ae. macrotis, Costellamussiopecten cristatus badense, Oopecten solarium, Macrochlamis nodosiformis, M. tournali and Pecten subarcuatus styriacus — were identified. Thereby the subgenus Costellamussiopecten was separated from Amussiopecten, elevated to the genus level and applied to the lineage including the European ”Amusium” — C. cristatus. Macrochlamis has been regarded as a valid name, and a senior synonym of Gigantopecten. ”Chlamys” represents a still unavailable genus-name closely related to the Chlamys group. The species level revisions include discovery of H. crispus based on previously erroneously identified specimens. Moreover the new material brought the first evidence of the presence of Ae. malvinae and ”Ch.” trilirata in the Grund Formation. The latter three taxa greatly enhanced the stratigraphic signature of this pectinid assemblage allowing an accurate inference of the Early to Middle Badenian (regional Central Paratethys geochronological unit isochronous with the Langhian, that is early Middle Miocene) age and a regional correlation with the Lower Lagenidae Zone for the NE Austrian Neogene basins. Abstract: The calcareous nannoplankton was studied in samples from the Grund Formation type locality (sections B, F, G and H). Samples from Grund-Windmühlberg (W1–W4) were further collected and investigated. The nannofossil assemblages are characterized by biostratigraphically important Helicosphaera waltrans, H. walbersdorfensis and the rare occurrence of discoasterids. Although the marker species Sphenolithus heteromorphus is absent in all samples, the composition of nannofossils enables specification of these deposits as Biozone NN5 of Martini (Lower Badenian). Regular presence of H. waltrans, which is usually limited to a short stratigraphic interval within nannoplankton Zone NN5, enables attribution of these sediments to the Helicosphaera waltrans Horizon (Svabenicka 2002). Abstract: This study was undertaken to solve the debate about the age of the sediments from the Grund Formation and to propose an environmental interpretation based on benthic and planktonic foraminiferal assemblages from the profiles excavated in 1998 and 1999 in the type locality of the Grund Formation (Lower Austria). In particular, quantitative data of foraminifers from Profile G were statistically treated to unravel the ecological gradients subtending the samples. Planktonic foraminiferal assemblages suggest a warm paleoclimate for this area. Benthic foraminiferal assemblages testify to strong re-deposition processes displacing shallow-water sediments from the inner shelf to outer shelf. Re-deposition may derive from storm events. Oxygenation of bottom waters is difficult to assess on the basis of benthic foraminifers. In particular, it is not possible to identify the dysoxic episodes suggested by the occurrence of chemosymbiotic bivalves living with anaerobic bacteria as in Zuschin et al. (2001). The studied sediments can be attributed to the Lower Lagenidae Zone in the Badenian (Langhian, Middle Miocene) on the basis of the presence of index fossils like Praeorbulina glomerosa circularis and Uvigerina macrocarinata. Abstract: Borehole Roggendorf-1 was drilled in the Alpine-Carpathian Foredeep (Molasse Basin) north of the Danube (Lower Austria). Biostratigraphic results and the lithological column revealed until now unrecorded Early Badenian (Middle Miocene) cycles. Calcareous nannoplankton was studied from the upper 800 m of a Neogene sequence and foraminifers were examined from the upper 410 m. The upper 2 m to 255 m fine clastic sediments of the Grund Formation (Lower Badenian, nannoplankton Zone NN5, planktonic foraminiferal Zone Mt6) show a deepening upward, with a maximum depth corresponding to outer shelf. Paleoecological evaluations demonstrate a distinct warming of the surface water. Down-hole, a clastic sequence follows starting with a gravel bed (347–360 m), and ending with a conglomerate bed on top (255–270 m). The latter is probably the transgressive base of the Grund Formation. The boundary of nannoplankton Zones NN 4–NN5 lies within this earlier Badenian cycle, which was deposited on the inner shelf, below 50 m. Limestone and sandstone pebbles originate from the Calcareous Alps and Flysch Unit. The underlying cycle of calcareous silty shales, sands and thin gravel layers belongs to the Laa Formation (Karpatian, nannoplankton Zone NN4; 360–612 m). Deposition occurred, partly under dysoxic bottom conditions on the outer shelf to upper bathyal. Surface waters were distinctly cooler than in the Grund Formation due to strong upwelling with nutrient enrichment. The Karpatian is underlain without a distinct unconformity by the Upper Ottnangian brackish Rzehakia (”Oncophora”) Beds, fine sands and shales, which are barren of fossils (612–678 m). The lower part of the investigated section belongs to the Ottnangian ” Robulus Schlier”. Nannoplankton determinations show that this still belongs to nannoplankton Zone NN4. Nannoplankton Zone NN3/4 is recorded on the basis of the occurrence of Sphenolithus belemnos only in the lowermost samples (790–800 m). Abstract: In the present study the ostracods from the Lower Badenian (Middle Miocene) Grund Formation of the Molasse Basin in Lower Austria are investigated. Most of the material comes from the type area of Grund. A total of 61 species could be differentiated within the Grund Formation. The following taxa dominate the faunal spectrum: Hemicytheridae (Aurila, Graptocythere, Grinioneis, Nonurocythereis, Pokornyella, Senesia, Tenedocythere, Urocythereis), Cyamocytheridea derii (Zalanyi, 1913), Cytheridea acuminata Bosquet, 1852 and Cytheridea paracuminata Kollmann, 1960. The ostracod assemblage reflects a shallow warm water environment with a water depth probably not exceeding 100 m. A part of the material is assumed to be re-deposited. Deep water elements are only represented by single specimens of Krithe, Henryhowella and Pseudocytherura. The stratigraphic classification of an Early Badenian age for the Grund Formation by means of Foraminifera can be supported mainly by the occurrence of Acanthocythereis hystrix (Reuss, 1850). Many species are also known either from Karpatian or from younger Badenian sequences in Austria. Furthermore a comparison between the ostracod contents of the formations of the former so-called Grund Beds is given (Karpatian: Laa and Korneuburg Formations; Lower Badenian: Grund and Gaindorf Formations). The occurrence of Loxoconcha vaisonna Carbonnel, 1969, Aurila larieyensis Moyes, 1965, Callistocythere karpatiensis Zorn, 1998 and Neocyprideis aff. corbleuensis Ducasse, 1995 in the Karpatian formations is most useful to separate them from the Badenian formations with the occurrence of Acanthocythereis hystrix (Reuss, 1850) and several species of Hemicytheridae. Abstract: The Grund assemblage comprises 45 vertebrate species from marine and terrestrial ecosystems. A whale, sharks, rays, bony fishes, and sea-birds hint at marine conditions, whereas a salamander, a pheasant bird, turtles, snakes and land-mammals indicate various terrestrial paleoenvironments. Biostratigraphically the upper part of MN5 (mammals) and the upper part of the Lower Lagenidae Zone (foraminifers) are indicated. The assemblage of Grund therefore serves as a reference point for the continental/marine correlation in the Central Paratethys. Abstract: We present new paleomagnetic results from the Middle Miocene in the Molasse Zone and the Vienna Basin system (Northern Vienna Basin, Wiener Neustadt Basin, Hainburg Swell, Mattersburg Bucht). The magnetic measurements were aimed at supporting stratigraphic age determinations where the polarity patterns of the primary magnetizations enabled a magnetostratigraphic zonation. Karpatian sediments in Laa/Thaya (brickyard) yielded a reverse polarity zone in the lower part (3.20 m) and a normal polarity zone in the upper part (6.10 m) of the sequence, which are assigned to Chrons C5Cr and C5Cn.2n. Three other sites in the Molasse Zone yielded single polarity results (two normal and one reverse polarity) for Badenian sediments. Only normal polarity was found in four sites of Badenian age from the Vienna Basin system. The new paleomagnetic results from Middle Miocene basin sediments (Karpatian and Badenian Stages) located North and East of the pre-Neogene Eastern Alpine Basement in Northern Austria show a general trend towards counterclockwise rotation of some 20 degrees with respect to the present North direction (according to 30° rotation with respect to the stable European continent). The observed rotation values and paleo-inclinations are in accordance with previous paleomagnetic results from Karpatian deposits in the Korneuburg Basin and other parts of the Alpine-Carpathian Foredeep. Abstract: Mollusc bearing Neogene strata were collectively designated as ”Grund Beds” in the 19th century. The different lithostratigraphic formations of these Grund Beds were studied in the Austrian Molasse Basin north of the Danube (Alpine-Carpathian Foredeep). Biostratigraphic methods and paleomagnetic measurements revealed that the entire Karpatian Laa Formation spans nannoplankton Zone NN4. It is transgressive on the Lower Miocene, Ottnangian marine sequences. The upper part of the Laa Formation correlates with the first occurrence of Globigerinoides bisphericus and is correlated in the type locality with the reverse Chron C5Cr and the normal chron C5Cn.2n. A distinct unconformity separates the Karpatian and Badenian sequences. The first Badenian transgression of the Molasse Basin resulted in a clastic sequence which, for the time being, has no lithostratigraphic designation. The lower part belongs to nannoplankton Zone NN4, with the first occurrence of Praeorbulina glomerosa glomerosa (Middle Miocene, Zone M5). The upper part of this basal clastic sequence belongs to nannoplankton Zone NN5. A coarse conglomerate, overlying a further unconformity, is interpreted as the transgression horizon of the fine clastic, more than 250 m thick Grund Formation. It spans nannoplankton Zone NN5 and contains Praeorbulina glomerosa circularis. Higher up in the sections, this species occurs together with Orbulina suturalis (plankton Zone M6). Ostracods and molluscs from the Grund Formation is distinctly different from the Karpatian, and indicate an unambiguously Badenian age. The normal paleomagnetic polarity measured in the type locality of the Grund Formation is interpreted as Chron C5Bn.2n. The Gaindorf Formation is coeval with the Grund Formation, developed along the western coast of the Molasse Basin. The more eastern development of the Mailberg Formation stratigraphically corresponds to the upper part of the Grund Formation with the co-occurrence of Po. glomerosa circularis and O. suturalis. In the Mailberg Formation a reverse magnetization is interpreted as correlating with Chron C5Bn.r.